"I like that this was not done well the first time"
Illumination founder Chris Meledandri - and the producer on Despicable Me - is working on an animated Super Mario Bros. movie that might just block out that hot mess of a Bob Hoskins movie from 1993 that we've all repressed. "I like that this was not done well the first time," Meledandri admitted to Variety. "I think that’s more exciting or more worthy than simply making another version of a film that was done incredibly well to begin with." 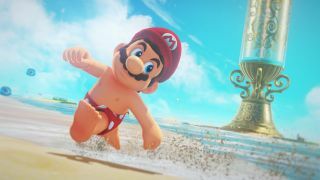 Reassuringly Mario dad Shigeru Miyamoto is collaborating on the project, and the movie's "priority development" status at Illumination means it should be in theaters by 2022. "We are keeping him front and center in the creation of this film," Meledandri says of Miyamoto. "I’ve rarely seen that happen with any adaptation where the original creative voice is being embraced like we’re embracing Miyamoto. There’s a history in Hollywood of people believing that they know better than the people responsible for a property. I’ve made that mistake before." Illumination's next movie, The Grinch, will be released on November 9 and has Benedict Cumberbatch playing the mean green hero. If you want to know what else is on the way, you can glimpse the future with our list of upcoming video game movies.